I have been developing internet websites for myself, my employers, and clients since 1996. The half-life of websites is pretty brief in these volatile times, so much of my early work no longer exists online. AMIS.ORG is the website for this academic society of which I am a member. I did not design the site, but I restructured the site's architecture and upgraded the content for standards compliance and continue to maintain all content. 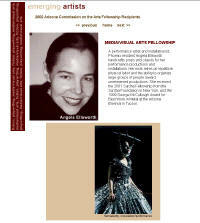 I was also the editor of the AMIS Newsletter for a couple of years, and I started and moderated the AMIS-L Listserv. I began developing this site in early 2008 and overhauled it in 2011. It promises to be a substantial resource for Mozart scholars. 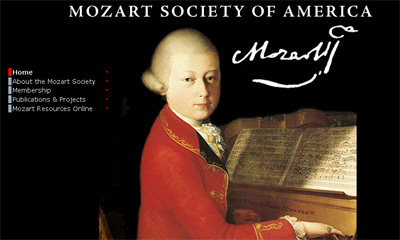 Of special value is the archive of early Mozart biographies. The Center for Old Music is an early music presenting organization established in 1977. I began performing the Center's resident ensemble in 1983 and have been a board member since 2003. I created and maintain this site as a volunteer. Oriscus.com is my personal web portal. I have been developing resources here since 2001, but have had other personal sites since 1996. There are various sections on my site that contain either serious business information or fun personal stuff. Most of the serious content has been moved to other domains, especially Mewzik.com for the musical instrument resources, and the GalacticMonitor.com portal to scientific resources. Musical Instrument Resources is an extensive annotated database of MI related sites. This is by far the biggest traffic area of my domain, currently generating over 1000 visitors a day, despite not having been significantly updated in a few years. 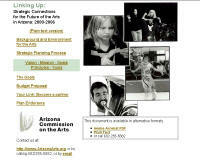 Technology Resources for Nonprofit Arts provides help in tech planning and development. 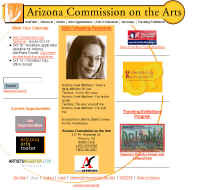 I developed this interest when working with the Arts Commission in Arizona. I am a certified arts technology consultant with the Kentucky Peer Advisory Network (KPAN), a program of the Kentucky Arts Council. Essays Archive contains short pieces I wrote some time ago about various subjects that pique my interest. See also the 2006-2007 archive of articles I wrote for Nougat Magazine (Lexington, KY). Other Interests/Proclivities is my personal home page with links to other activities I'm involved with, including art, family, travel and music. You can also see the development of my user interface over the last several years. The musical instrument information pages on Oriscus.com proved so popular that I moved those activities to their own domain. At this writing, the resources exist partly on both sites as they transition fully to Mewzik.com and other domains. The most current area here is the Mewzik Gadget of the Day blog. MetaHammer is a blog site relating to virtual world technologies. Primcutter is a blog site relating to personal philosophical and creative work, both in virtual and real worlds. I was the full-time marketing coordinator and webmaster for the UK School of Music from November 2003 until 2011, when I was kicked upstairs to oversee the websites for all of the departments of the College of Fine Arts. In the summer of 2004, I did a major overhaul of the Music site, with contains several hundred pages. I developed a lot of MySQL/PHP database-driven content, especially for the events calendars and faculty lists. 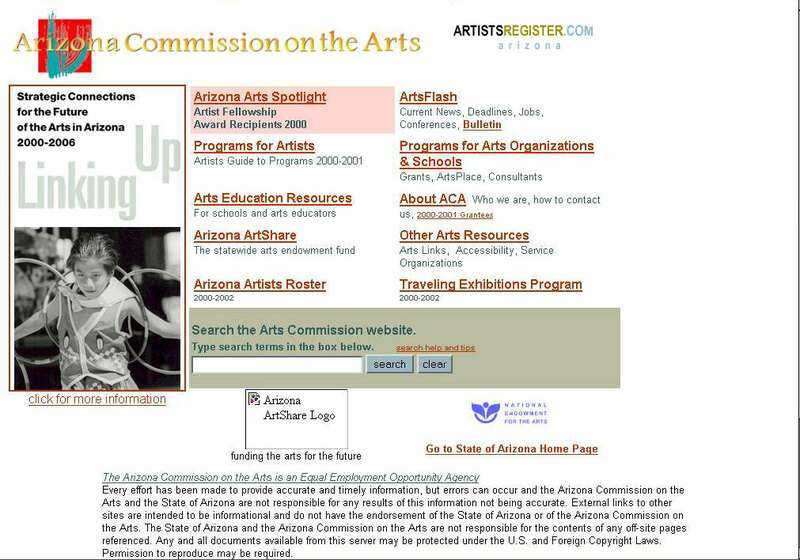 In the fall of 2012 we combined all of the disparate Fine Arts sites (including Music, Art, Theatre, Arts Admin, and the Singletary Center for the Arts) into a new Drupal-based content management system. Kentucky Festivals was a partnership of Arts Kentucky, Kentucky Craft Marketing Program, Kentucky Arts Council, Kentucky Folklife Program, Appalachian Heritage Highways, and Kentucky Department of Travel/Cultural Heritage Tourism. The project is made possible in part by grants from the National Endowment for the Arts and the Appalachian Regional Commission, and was managed by Arts Kentucky. I was the web developer for the project under a contract which lasted two years, ending in early 2005. I was given a grant by the Kentucky Historical Society to convert their published index of roadside historical markers into a searchable online database. This involved pulling the data from the original Pagemaker formatted text file and normalizing it in an Access database with appropriate HTML tags for text formatting. There were nearly 2000 historical marker records in the database. This serves as the basis for ASP search forms to pull up the various records. I created a beta site on my server that generated around 100 to 300 visits a day before it was even launched. KHS has since integrated the database into their own website. 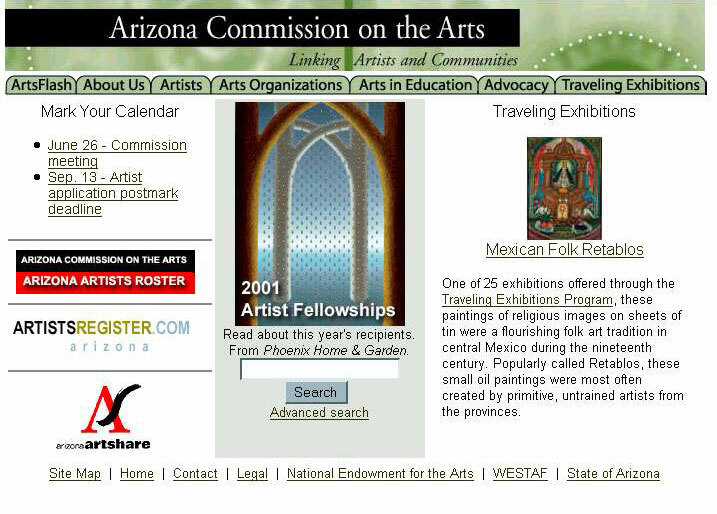 Arizona Commission on the Arts (ACA) is the state government arts agency, where I was on staff from July 1998 to September 2001. I was contracted to maintain and develop the website for another six months after that. I created their first website from scratch in 1998. It underwent two major revisions before the end of my contract in February 2002. There is only a little evidence of my work left, but I do take credit for moving the Commission onto the web, which resulted directly in massive savings in printing and postage for their several annual publications. I worked as an office manager here in the mid-1990s. At the time BCLC had no internet presence and only one shared dialup access. This was all about to change as we oversaw the installation of public access computers in all of the county's 14 local libraries as part of a Gates Foundation initiative. I created the county library's (and my) first website using the WYSIWYG editor that came with the Netscape browser. 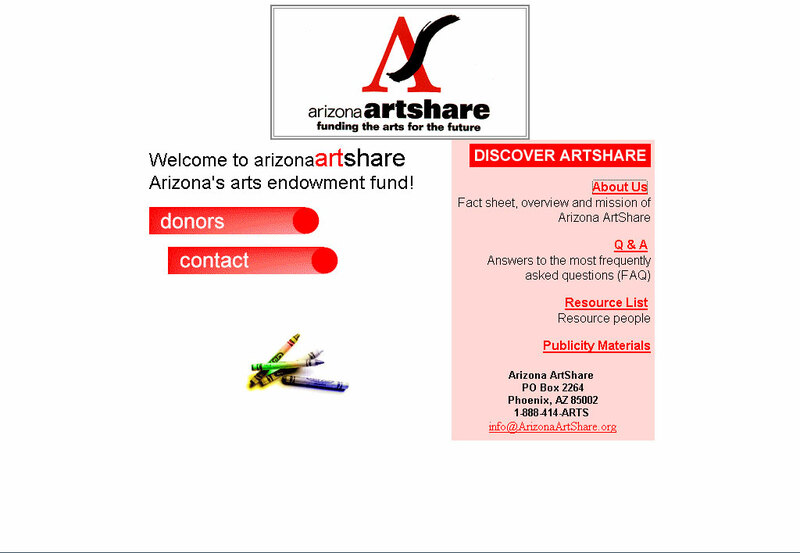 2001 Arizona ArtShare is the state's endowment fund for the arts. 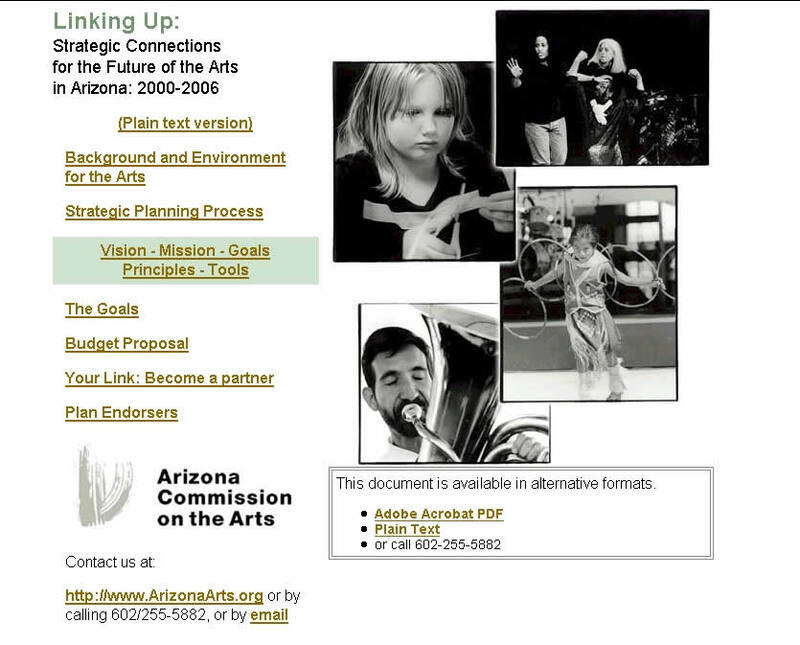 A unique public/private partnership, I was a member of the Strategic Communications Committee which included executives from the Arts Commission, the statewide arts advocacy organization, and public relations and media companies. The website occasionally promoted fundraising events such as ArtShare Goes to the Movies. Created in 1999, maintained until September 2001. It has since been allowed to lapse. 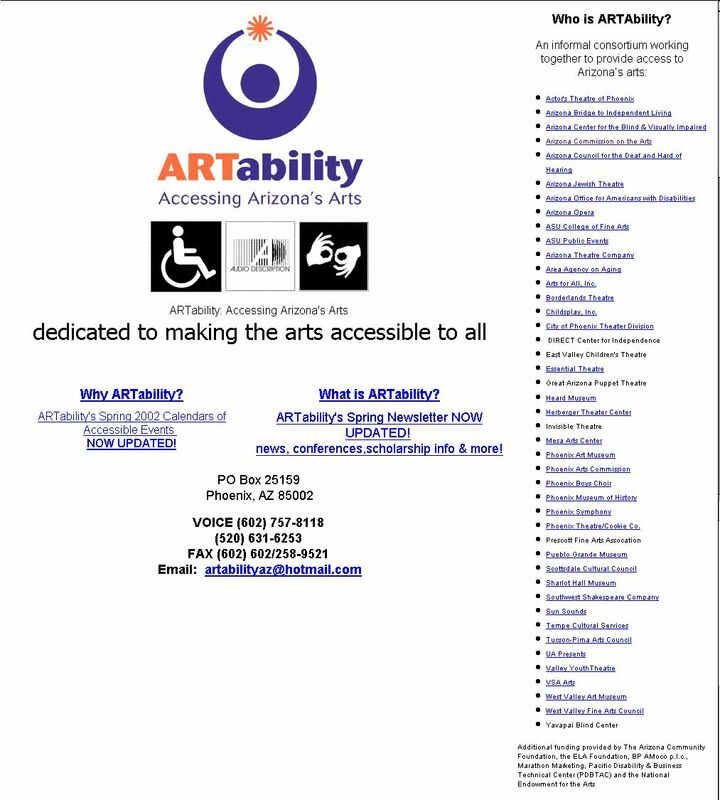 1999 ARTability was a cooperative program among Arizona public arts agencies and nonprofit arts organizations to provide accessible arts opportunities to disabled constituents. 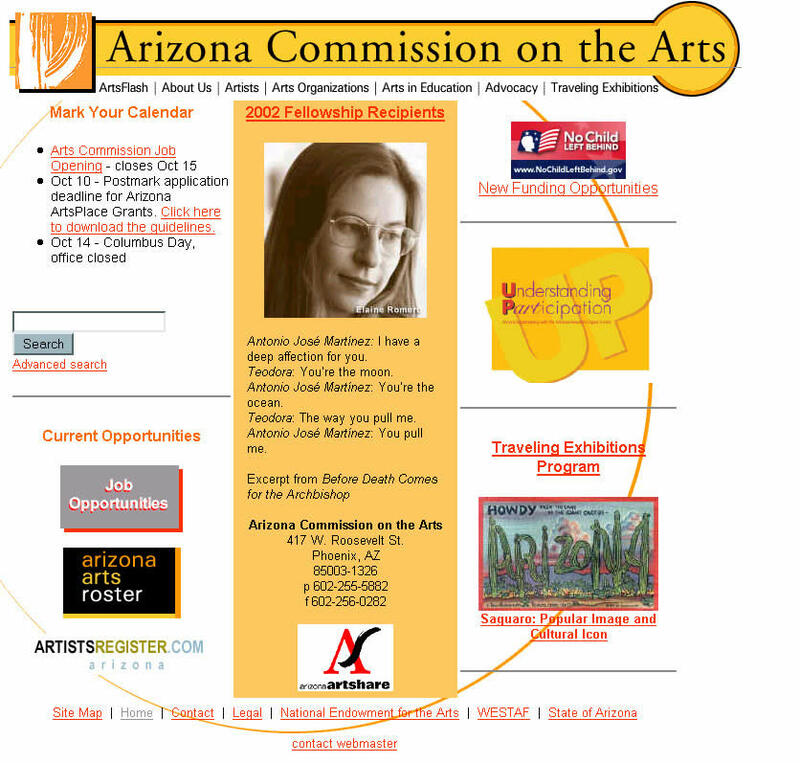 The layout and design were made intentionally very simple in order to assure ADA accessibility and to allow their Director an easy way to edit and maintain the site herself using Netscape Composer. Created in 1999. It has since been redone by another web designer. 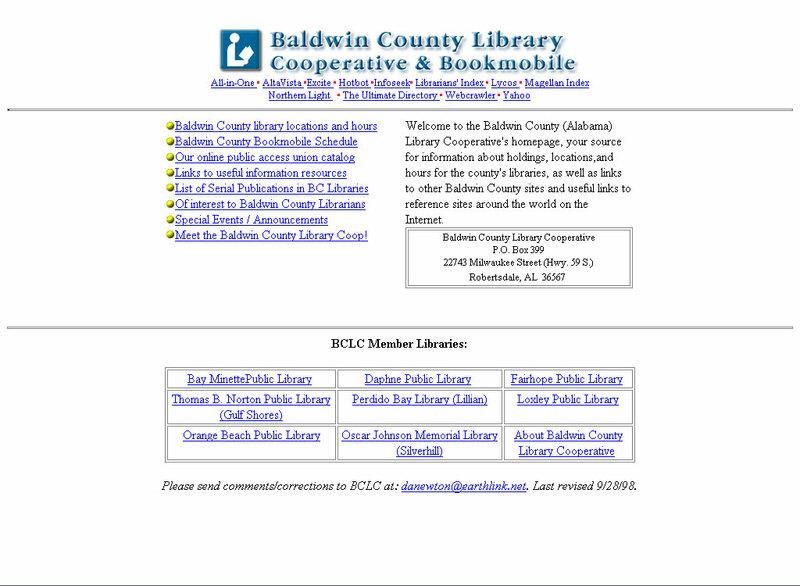 1997 Baldwin County Library Cooperative serves a rural Alabama county with eight small city libraries. We were among the first in the nation to receive public-access internet computers from the Gates Foundation, but we had already provided similar equipment to our member libraries. In addition to installing and troubleshooting these systems, I created many useful online resources for both librarians and the public. The site I created no longer exists, though the current content is clearly inspired by the work I did. Please send your comments or suggestions!